Cleveland Bay horses originated in England during the 17th century, named after its coloring and the Cleveland district of Yorkshire. They are the oldest established horse breed in England, and the only non-draught horse developed in Great Britain. Cleveland Bay horses are well-muscled, with legs that are strong but short in relation to the body. They are always bay in colored, although a few light hairs in the mane and tail are characteristic of some breed lines. In the middle ages in the north east of England bay colored horses were bred for pack work, which was the preferred way of transport of the travelling salesmen, often referred to as chapmen. So these horses were called Chapman horses. In the 17th century breeders crossed the Chapman horses with imported Andalusian and Barb stallions to produce a fine coach horse, renown for its stamina and active paces. The main breeding area was in Cleveland Bay. With the introduction of motorized vehicles coach horses were no longer required. A small number of Cleveland Bay horses survived and were crossed with the Thoroughbred to produce a handsome, upstanding, heavyweight hunter and excellent carriage horse. 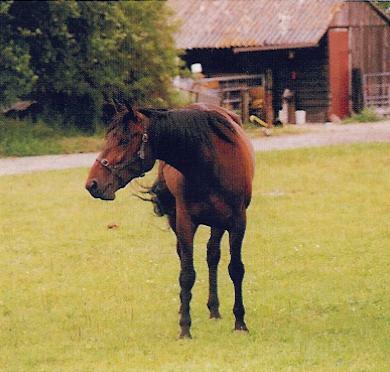 The survival of the breed was greatly helped by Queen Elizabeth II who bought a colt named Mulgrave Supreme that was broken to saddle and harness and made available to breeders of pure-bred and part-bred Cleveland Bay. Prince Philip drove teams of these horses in international four-hand events. This led to new interest in the breed. There are approximately 500 Cleveland Bay horses world wide, mainly in Britain, North America, Japan, New Zealand, and Australia.